Big Boss XHose 75 ft. Triple layer construction expandable garden hose that expands up to 75 ft and contracts when water is turned off! Lightweight and will never kink or tangle. Emson warrants that, for 1 year the original purchasers XHose wont have defects in material or craftsmanship. If XHose is found defective during this time, we will replace or repair XHose at our option. To obtain the replacement or repair, send the product, your name, address and phone #, the nature of the issue with your item and $9.95 for processing and handling (by check or money order ) to EMSON 230 5th Ave, Suite 800 NY, NY 10001. You may direct questions to customer service at 1800-423-4248. When you ship your product to us make sure you can track your shipment and insurance, as we are not responsible for and the warranty does not apply to items lost or damaged in transit. This warranty does not cover damage that is as a result of misuse and abuse. This warranty excludes incidental and consequential damages of any kind whatsoever. The Big Red Blaster Turn Your Garden Hose into a Fire Hose! High-pressure technology seen in professional firefighter hose nozzles. On and Off large control knob for easy usage / manipulation. Twist adjustable tip clockwise to change stream intensity easily. Ergonomic handle offers a comfortable Grip. XHose 75 ft. 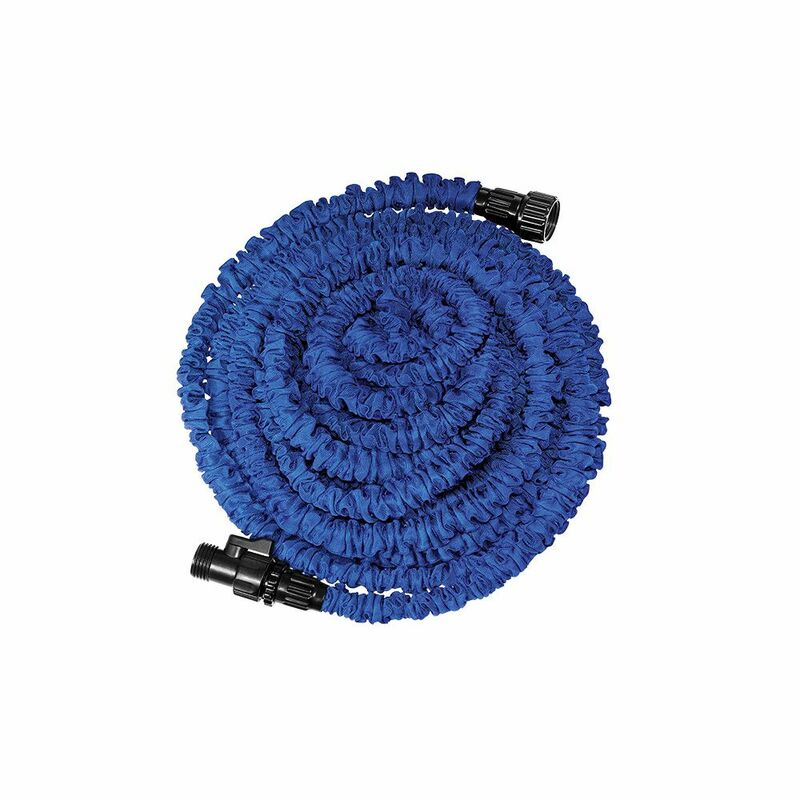 Triple layer construction expandable garden hose that expands up to 75 ft and contracts when water is turned off! Lightweight and will never kink or tangle. XHose 75 ft. is rated 2.0 out of 5 by 5. Rated 3 out of 5 by Bonnie from Moves out of position Stores easily in my one car garage. It only expanded about 20 ft without water pushing through it. When it finally was long enough to reach where I wanted the sprinkler, I shut off the water and connected my sprinkler. When l turned the water back on, the pressure from the water and the additional expansion of the hose quickly moved my sprinkler out of position. Need a lot of patience and heavy sprinklers to make this work with anything but hand watering. Rated 4 out of 5 by Doug from my review Folds away nicely after use.Just long enough to reach where I have to use it. Rated 1 out of 5 by SMMM from Disappointing Like the length and convenience but leaks badly where hose joins plastic connector(on the hose itself. )Will be returning it. Rated 1 out of 5 by MrMcG from Worked good until it stopped working... Product worked well until it failed after only 2 weeks (in the hose itself, not the connectors). I do not recommend this product. Spend more to get a better product.